Speechless Peanut Butter is kosher certified peanut butter made with Dry Roasted Virginia #2 peanuts contains no artificial sweeteners, no hydroxegynated oil and no salt or sugar. Speechless peanut butter has no carbs and no trans fat, it’s high in protein, high in energy and tastes great. It will keep in the refrigerator for up to a year, on the shelf ninety days. The oil separation is a natural occurrence, proving to the consumer there are no additives and stabilizers in their food. Stir gently to remix oil and peanuts. 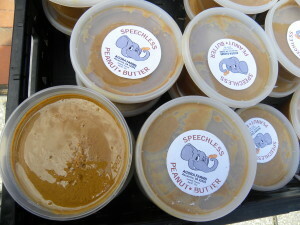 Speechless peanut butter is versatile and can be used in sandwiches, cookies, pies, icings and more.